In Cruden Parish Church we are committed to providing regular and meaningful worship within the tradition of the Church of Scotland and as part of the worldwide Church of Jesus Christ. We will use, through Christian fellowship and education, our God given resources, which are rich and varied, to encourage the development of Christian faith and practice in all ages and groups within the church and the community. We will let our awareness of the needs of the congregation, the community and the world direct our church life and the activities and projects we will support. This page has been prepared to provide an opportunity to learn something about a congregation which plays a part in the lives of more than 500 people, some of whom will be your neighbours and friends. If there is anything more you want to find out, please contact the relevant person as listed in the website or myself. We would be delighted to answer your questions. The Minister is available to anyone in the parish who would wish to speak with him. It is best to phone first to arrange a mutually suitable time. Families who have someone in hospital should inform the minister if they wish a visit to be made. Located over the Bishop's Bridge from the Hatton to Cruden Bay road, via Bridgend. 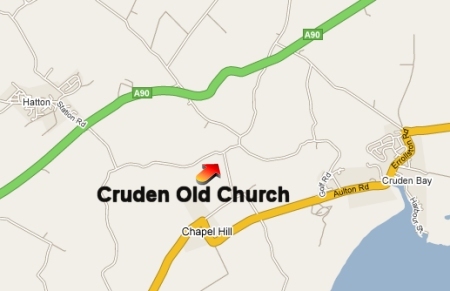 Lookout for the Cruden Old Church signs on the A90, Hatton to Peterhead Road, and at the Bishop's Bridge turn off. If you are coming from Cruden Bay look for the sign on the right on the Cruden Bay to Newburgh Road before you reach St James' Scottish Episcopal Church. The Kirk Session decided in August 2007 that, because of the vast amount of money required to upgrade this building and the little use made of it, it would be no longer used after December 2007. 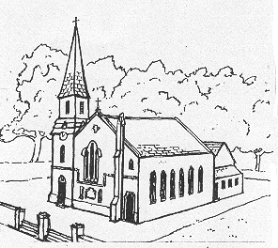 The last service in the Church was held on the evening of 30 December 2007 when the guest preacher was the Rev James Wishart, minister of Old Deer. Children are baptised in Cruden Church according to the regulations of the Church of Scotland which requires that one or both parents are members or have expressed a sincere desire to join the church. Couples, whether members or not, are welcome to have their wedding service in the Old Church. It should be remembered that the Old Church seats 130 downstairs with room for many more upstairs. Couples should contact the minister to arrange a suitable time to discuss with him their wedding service. Available from the minister is a leaflet which gives information about weddings in Cruden Church. The Old Church is available for funerals. Hymn books (or, in the case of a requested hymn not being in the hymn book, duplicated hymn sheets) are available for use. 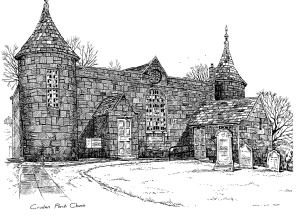 For those engaged in ancestor research, it should be noted that Cruden Church has no records going back to the early 20th century. We have fulfilled the requirement to hand over all records over 50 year old to the Scottish Records Office. More information about old records can be found on the Scotland's People Website. The responsibility of spiritual oversight of the congregation lies with the elders who together, with the minister, form the Kirk Session. The Session meets usually on the third Monday of a month. The Session Clerk is Mr Robert Esson. The Session has 6 committees and serving on them, as well as the elders, are 9 people elected by the congregation at the Annual Stated Meeting in March. 3 of the 9 retire each year but are eligible for re-election. Bible Study is at the heart of Christian Life. Enquiries will be welcome from anyone interested in Bible Study. The monthly Bulletin will give details when courses begin. Let us know what you would be interested in. The ladies of our Guild meet once a month - the last Monday at 7.30 pm using the Old Church Hall as its main venue. Each winter a varied syllabus of meetings is organised by the committee, whose Convener for 2007/2008 is Mrs Muriel Cantlay. In April each year a sponsored walk fundraiser is organised. The Guild happily arrange transport for any lady who would like to attend any of their meetings. Property Reports, commissioned in accordance with a scheme laid down by the General Assembly, have indicated the need to meet substantial costs in bringing our properties up to a satisfactory standard. Under our Property Convener, Mr Robert Esson, much progress has been made in the last few years to improve the standard of our Church but our Fabric Fund would always benefit from any donations which would be gratefully received. They should be clearly marked for the Fabric Fund. A retiring offering is taken after each Communion Service in aid of the Fabric Fund. During school term time, there is a Sunday Club meeting in the Old Church Stables prior to the time of the morning service. The youngsters usually attend the first part of the church service before returning to the Stables for their own activities. When the Sunday Club meets, a crèche facility is also available in the Stables annexe of the Old Church Hall. The Junior Church is under the leadership of Mrs Katherine Hyman. The Church of Scotland has a deep concern for the wholeness and well-being of each individual. It seeks to safeguard the welfare of all people, regardless of age, who come into contact with the Church and its organisations. It is the responsibility of each individual within the fellowship of the Church to prevent any physical, sexual or emotional abuse. The Kirk Session has appointed Mrs Kathleen Craig as Child Protection Coordinator. She ensures that all those working with young people in the church have been properly appointed and vetted by the authorities in line with the requirements of government and church legislation. The Choir meets to practise the hymns as well as special items. From mid August to May practices are most Wednesdays at 7.30 pm in the Old Church Hall. We welcome the occasional visitor who would enjoy an evening of praise and fellowship. We would give an even warmer welcome to anyone who wanted to come and join. In the past, joint praise services have been held on about four Sundays during the year, hosted in turn by the Congregational Church, the Episcopal Church and ourselves with the fourth one being outdoor in August at Cruden Bay Harbour. On the last two Sundays of May, we unite with St James Episcopal Church to share in each other's services of communion. Occasional meetings take place between the clergy and elders of St James Episcopal Church and Cruden Parish Church. Anyone interested in joining the Church should start attending worship. When required by those already attending worship, a membership class will be held. Topics covered are the Christian faith and life and the responsibilities of church membership. Cruden Bay Rainbows meet in Port Erroll School on Tuesdays from 4- 5 pm under the leadership of Mrs Annabella Vidgen. Cruden Bay Brownies meet in Port Erroll School from 4 – 5.15 pm on Thursdays under the leadership of Mrs Nicola Metcalf. For girls aged 10 to 15. Hatton Guides meet in Hatton Village Hall on Thursdays from 7 - 9 pm. They are currently looking for a leader. Cruden Bay Guides meet in Port Erroll School on Mondays from 7 - 9 pm under the leadership of Mrs Pamela Farr. Attached to Cruden Church is a company of the Boys' Brigade. Boys in Primaries 2 3 and 4 are eligible for membership of the Anchor Boys. Boys in Primaries 5, 6 and 7 can join the Junior Section. At the moment, there is no Company Section for older boys. Under the captaincy of Mr Colin Skinner, the Company meets in Port Erroll School. Anchor Boys are led by Mrs Alison Neilson and the Junior Section is led by Mr Colin Skinner. Both sections meet on a Wednesday evening from 6.30 pm to 7.30 pm. Members are invited to sign their names on the Flower Calendar in the Church Welcome Area if they would like to place the flowers on the Communion Table on any particular Sunday. Each month apart from July and August, our Church magazine is delivered to the homes of all our members, keeping them informed of what is happening in our congregation and in the church at large. We are happy to deliver the magazine to non-members who would like to receive a copy of the Bulletin. Each year, in the middle of May, some of our members are involved in a house-to-house collection on behalf of Christian Aid. The whole parish is covered and over £2,500 is raised. This is added to by monies raised from one or two other ventures.